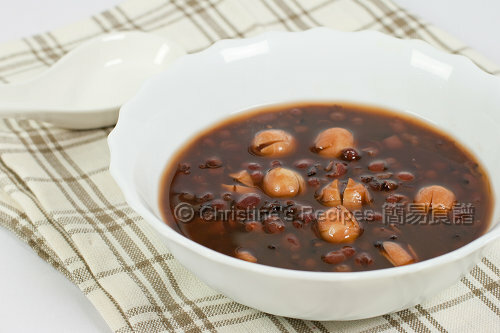 Here comes a traditional Chinese dessert, red bean sweet soup, that was requested by my reader via email. This popular dessert has many different versions, widely accepted around South Asian countries. If you go for a traditional Chinese banquet, you’ll notice this dessert would often be served to wrap up the dinner. 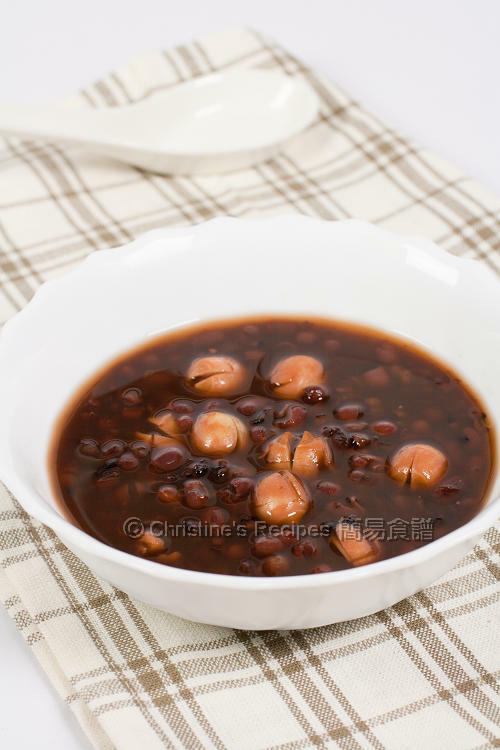 Lotus seeds are always paired with red beans in Chinese dessert. Kindly note that right in the middle of a lotus seed, there is a dark green core. It must be removed before cooking because you don’t want your dessert turns bitter. I also added black glutinous rice this time. 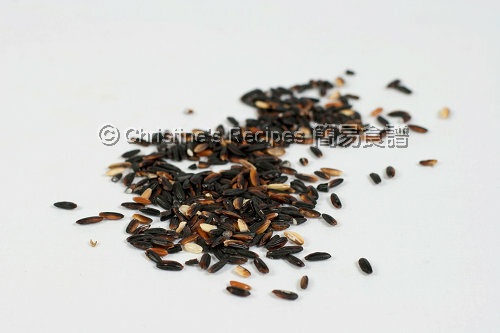 The black glutinous rice is very healthy, rich with vitamins B and helps strengthen our blood system. It’s very popular to top with some coconut cream when served. Soak red beans for at least 3 hours. If over night, the cooking time would be shortened even more. Rinse and drain well. 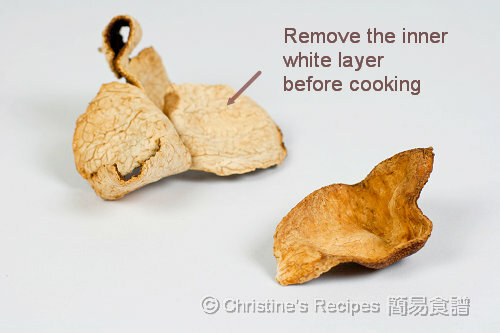 Soak dried mandarin peel for 20 minutes. Use a knife to scrape off the inner layer. Set aside. You can adjust the amount of red beans and black glutinous rice according to your preference. If you would like to enjoy the texture of whole red bean, you just cook to the point what I had. If you like the soup thicker, cook longer time. Or mash the red beans when it starts to soften so that you can shorten the cooking time. Many people like to top it with some coconut cream/coconut milk when served. If you’re living in some areas where you hardly find any good quality dried mandarin peels, you can replace with fresh orange peels (orange part only, 2 strips 1x3cm long each). The result is quite good. hahaa! I use thermal pot for this too! Need to cook the red beans very long to "break them down" to softness. But such a comfort dessert in the colder months cos red beans brings more "heat" than green beans. Right? My favourite soup. It's really healthy and delicious. I love it cooked in pressure cooker where the beans become very smooth and soft and still stay whole. I need to cook again...would be great in this cold weather. You make this classic dessert look extra yummy :) I'll have to ask my mom to take a look at your recipe coz she loves black glutinous desserts - thanks for the link too! Yes I am familiar with this dessert Christine! It looks even better than what you get in Chinese restaurants... Thanks too for the great tip on the mandarin peel - never realized you had to remove the white part. I love this Chinese sweetened soup. Didn't know the white part of mandarin peels has to be removed before using. Thanks for the tip. I always find red bean sweet soup warm and comforting. Also love to have it with black glutinous rice or glutinous rice balls : ). This is my favourite 'tong sui' but I always forget to add in the black glutinous rice. Good tip re the orange peel. Love this dessert! One of my favourite when I was a young kid. I've never cooked this and would like to try. Can you give a rough estimate of the amount of rock sugar typically used as I'm totally unfamiliar with this dessert? I have a friend who loves it, though, and I'd like to make it for him. Oh, I used to drop the rock sugar bit by bit and taste until I find it's sweet enough for myself. It depends on how much water you got left after cooking and how sweet you like. Made this with green beans also, was pretty good, but instead of adding hard rock sugar traditionally used, I used fructose, then on serving added agar nectar to taste, alot less calories and tast just as good. Yummy! I've never used a thermal pot before... I don't have room in my kitchen for more appliances either! :( I'll just stick with my aunts method - my good old fashion Chinese style! :D I love your blog! Hope you can advise. Will the glutinous black rice thicken the soup or it won't ? The black glutinous rice is not starchy as the white one. It'll absorb some water but won't make the soup too thick as the white one.